Pep Guardiola To Leave Barcelona, Where Next For The Uber Coach? Regardless of the two Champions Leagues and the 11 other trophies he’s won since 2008, it seems the shame of conceding a Fernando Torres goal was too much for Pep, as Reuters are reporting that he’s announced this morning that he’s to stand down as Barcelona coach at the end of the season after five years in charge at the Camp Nou. Still only 41-years-old, the former deep-lying playmaker won three La Liga titles, two Champions League trophies, one Copa del Rey, three Spanish Super Cups, two UEFA Super Cups and two FIFA World Club Cups in just four seasons at the helm for Barca, an incredible haul of trophies. However, now the suave tactician looks all but set to leave. Whether or not leaving after such as a disappointment as the Catalans’ shock Champions League exit is the best decision to make remains to be seen, but there are now two very interesting questions on everyone’s lips – 1) What next for Guardiola himself and 2) who will replace him in the Barcelona hot-seat. The young whippersnapper is expected to take some time off from football (probably an entire year), but when he is ready to return he’ll have a queue of suitors prettying themselves for him. A known fan of the Premier League, could Pep end up at Stamford Bridge, or maybe the Etihad? Another theory doing the rounds is that he may take over at Arsenal when Wenger decides to quit. Or is he Fergie’s replacement at Old Trafford? What do you think? And as for who’ll take the hot seat at Barca, Big Sam is probably waiting eagerly by the phone, though surely Athletic Bilbao boss Marcelo Bielsa is in with a shout? That said, interestingly, former Barca player Ernesto Valverde – who was a huge success at Olympiakos – is said to be the current favourite. Or what about my outside bet – Alex McLeish (taking Emile Heskey with him, of course)? this guy grew up in the Barca system and inherited at least the most integral members of perhaps the best club side ever. while he may have known how to squeeze the most out of their potential, i don’t think we’ll really know how good a manager he is until he succeeds somewhere else where his work isn’t almost ideally cut out for him. for now we know he is good, but if he is great remains to be seen. Frank Rijkaard left him with a great squad, so its all a bit meh atm. Outside guess would be the return of Johan Cruyff who put in place this tic tac toe football they play, a few weeks back people was talking about him giving up his position in Mexico. But hes an old fella now. My money is on Luis Enrique handing in his notice at Roma and taking it up. Seems a bit mad to me. A couple of weeks of signing on he might regret this. He won’t get benefits straight away because he left the role himself. Morinho to Man Utd and Pep to Real Madrid anyone?? but I do see Morinho at Man U and could see Harry as England manager and Pep trying himself out at Spurs!! “Pry” Bielsa from Bilbao? His contract also expires this summer. But apparently Tito Villanova will be the next coach. apparently tito villanueva has been announced as the new manager for barca. I think he may be headed to the couch, and will be watching matches on TV not from the sidelines. Its not that wild an idea to think he might take the England job, at least for a year. Being a national coach leaves a lot of time to rest, he won’t be dealing with demanding journalists every week and the FA would pay fairly well. Steve Bruce will take over and take Titus Bramble with him. Why does everyone believe he’s going to England? Not to mention that he quit because of two major upsets in the last few days. It’s been reported for weeks and maybe even months before that he was stepping down at the end of the season. I hope he doesn’t come to England, I’d hate for a manager of his calibre to put up with Abramovich at Chelsea. He’ll be fired even if he does bring success to the club. God knows Mourinho was. Chelsea fans and board are so fickle that even if Di Matteo won them the Champions League they would get rid of him for the sake of having someone more shiny and “better”, no other club in England has either the money nor the set up for success within a season. Other than Manchester United. Ferguson is obviously going to hold on till he’s in the ground. I find this pathetic, he’s running away from the face of adversity. 2 big losses in one week, big deal. He thinks he can’t manage a team after that? I will laugh at anyone who calls him one of the best managers in the world just because of this. PEP MADE HIS DECISION IN OCTOBER. In fact, if you’ve been checking the news at all this season, all the warning signs have been there that Pep was thinking of leaving. It’s one of the reasons, I believe, the Barcelona has been underperforming a bit this season, as everyone knew something was up. He’s looked depressed at EVERY news conference this season, he even stated back in March that the league was totally lost at one of the conferences. The reason he decided now to release the news was because Barcelona are now out of their major title races and theres no risk of players getting distracted. And for everyone who says he inherited a great team from Rijkard, what about Busquets, Pedro, Pique, Thiago, Alves, Mascherano etc. Most of those players started under Pep on the B team or were brought in by him and are now arguably some of the best in the world at their current positions, and the Spanish players, apart from Thiago, played a huge role in winning a World Cup. Barcelona CLICKED with their new formation under Pep, specifically with the “Busquets role.” as much as you may or may not like him, ask our friends over at Zonal Marking– Sergio’s role and Pep’s system which flowed around him revolutionized the way Barça play. 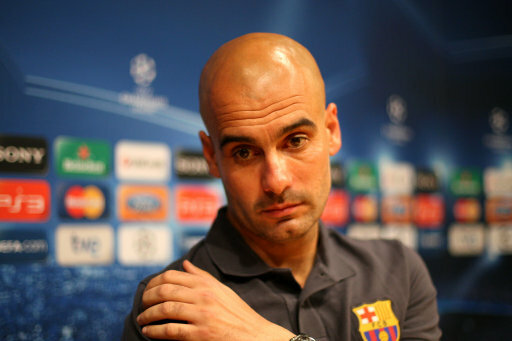 That was all Pep. Ian Holloway. That is all. Tito has taken charge and now he’s gonna pay Jose with an eye for an eye! !